Jennie had a fantastic holiday in Anglesey, where she spent the week in the sunshine with her support worker, Sarah. When they arrived, the first thing Jennie wanted to do was to go to the Sea Zoo, where Jennie had the opportunity to do some colouring in and have a look at lots of fascinating underwater creatures. Jen and Sarah then had lots of laughs playing miniature golf, although they both struggled with the putting! 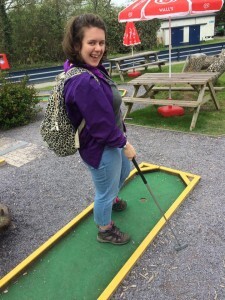 There were lots of activities for Jen to do in Anglesey, so Sarah and Jennie headed out to Pili Palas, where there is a butterfly house as well as exotic animals and insects, meerkats and a petting farm! Jennie loved interacting with the animals and stroking them. 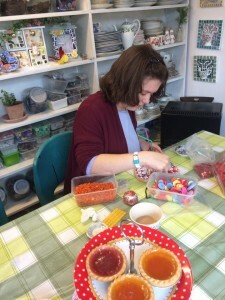 Jen also had a great time at a mosaic making class, where she made a beautiful heart shaped wall hanging and a trinket dish too. There was plenty of time for walks on the beaches and bays throughout the week, where Jennie would collect pebbles to paint and splash about in the sea, or stop to enjoy an ice cream. To make the most of Jennie’s last day, Sarah asked Jennie if she would like to visit Llandudno, somewhere she has enjoyed on previous occasions, or if she would like to go to Rhyl which would be a new experience. Jennie chose to go to Rhyl and the pair had a lovely walk around the town, going in several of the shops and arcades and spending a long time walking on the beach before setting off for home. Independent Options supports Jen so that she is able to live as independently as possible. To find out more about our Supported Living service, click here.